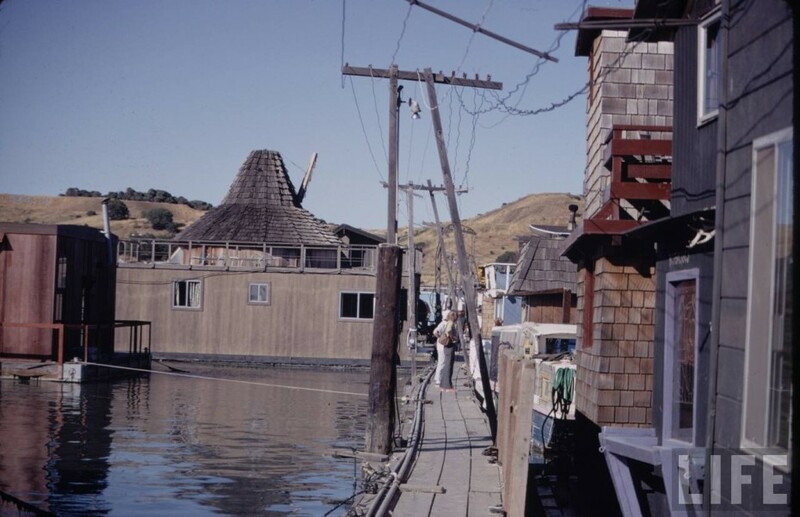 I found this photostory lurking in the depths of the LIFE archives, titled “Floating-Houses-California” by Michael Rougier. No other information provided. 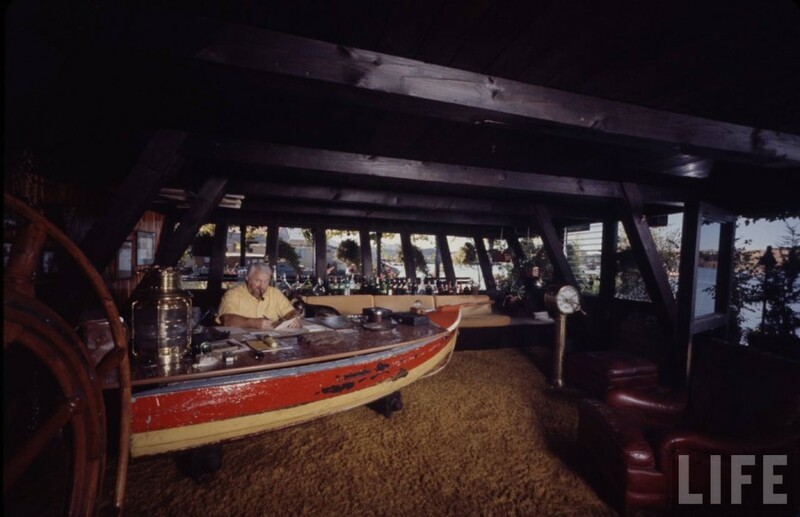 It took me a moment to figure out exactly where Mr. Rougier had taken these images by trying to identify at least one of the quirky floating structures he’d photographed through a Google search of various marinas and harbours around California. 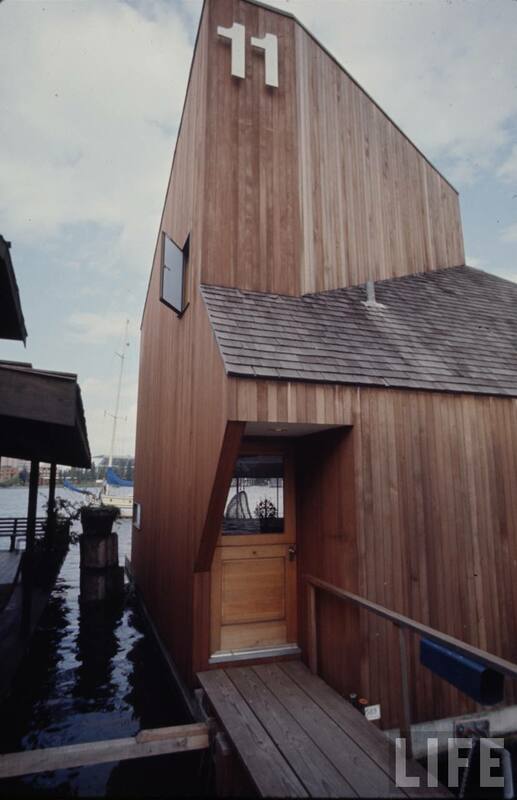 In the end, I found a grainy little photo that matched the most eccentric of the waterfront arks ↑. 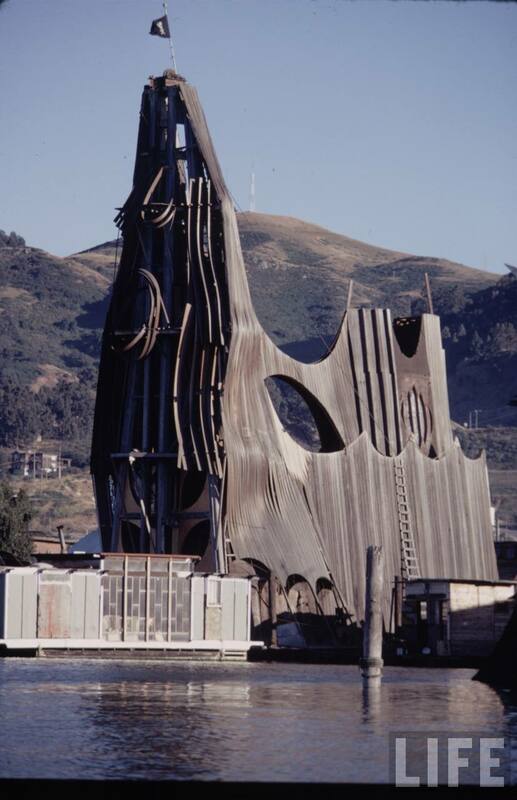 Its caption gave away the location: “The Madonna, built around an old pile driver, was a Gate 5 landmark until it burned in 1974”. 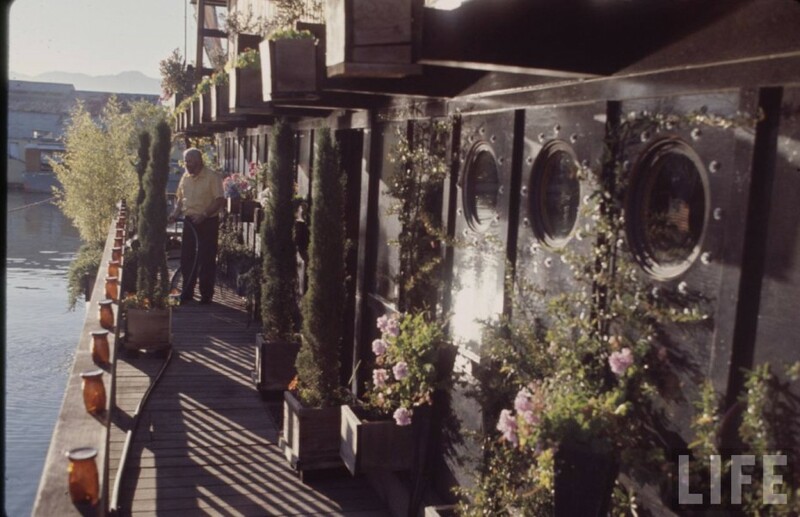 Gate 5 refers to the houseboat community on the site of a WWII era ship building company in Richardson Bay, Sausalito. 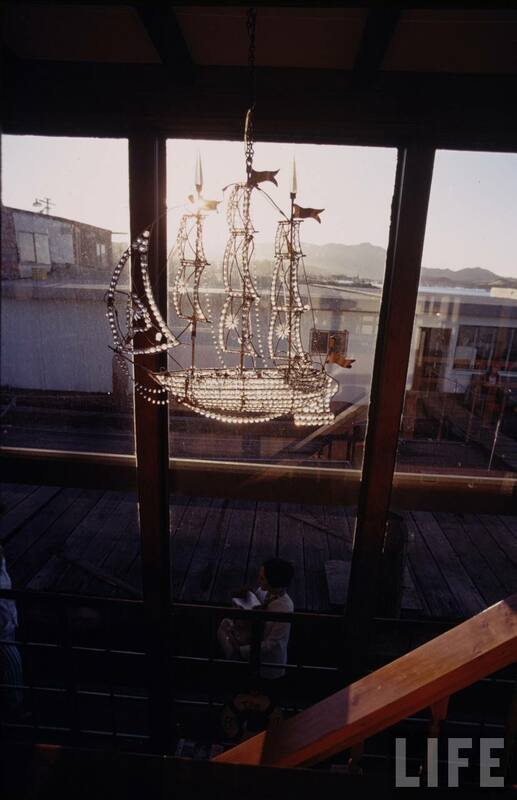 After the war, thousands of people flooded into the waterfront area to work in the new shipyards. 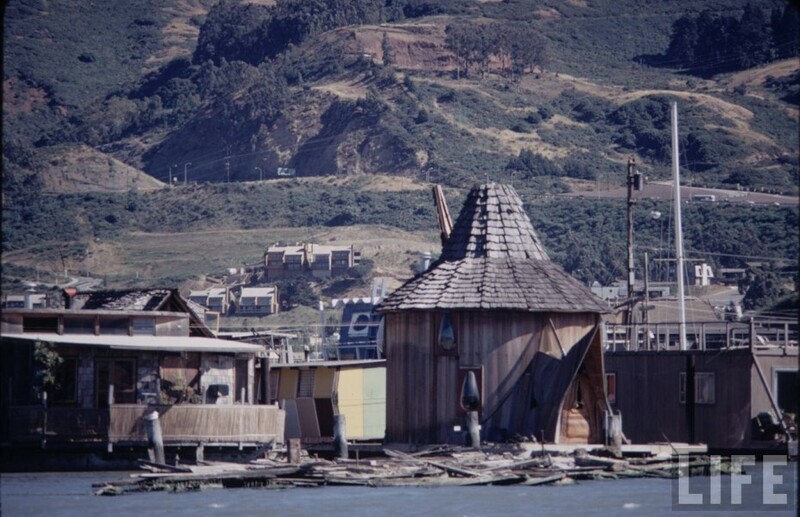 Housing was scarce, but since they were building ships anyway, the laborers got crafty and began salvaging materials from old boats to create their own make-shift homes. 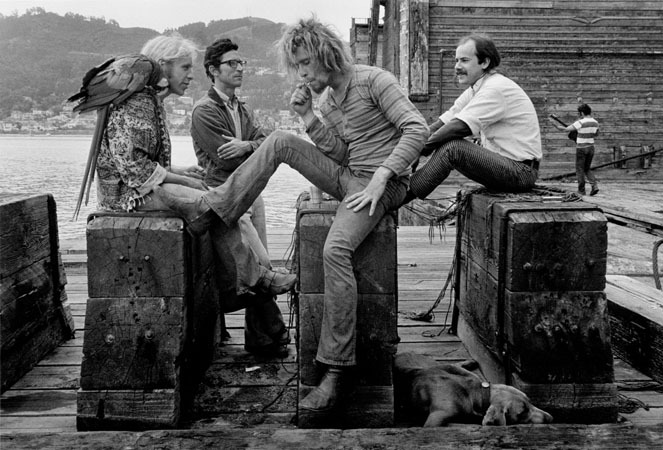 Not soon after, struggling artists and hippies got wind of the alternative lifestyle and liked what they saw. 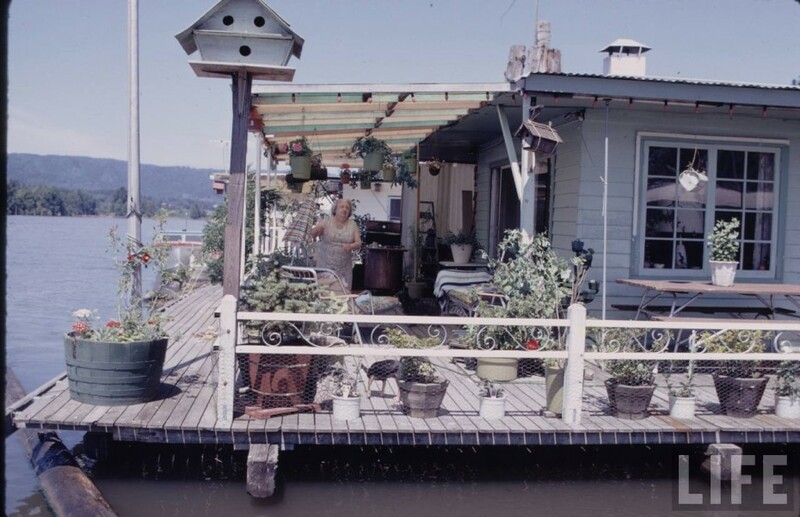 They settled in during the sixties, some homes could barely float, some were perfectly navigable houseboats that floated freely around the bay, but most all of them were eccentric, fanciful and dreamy places to live. 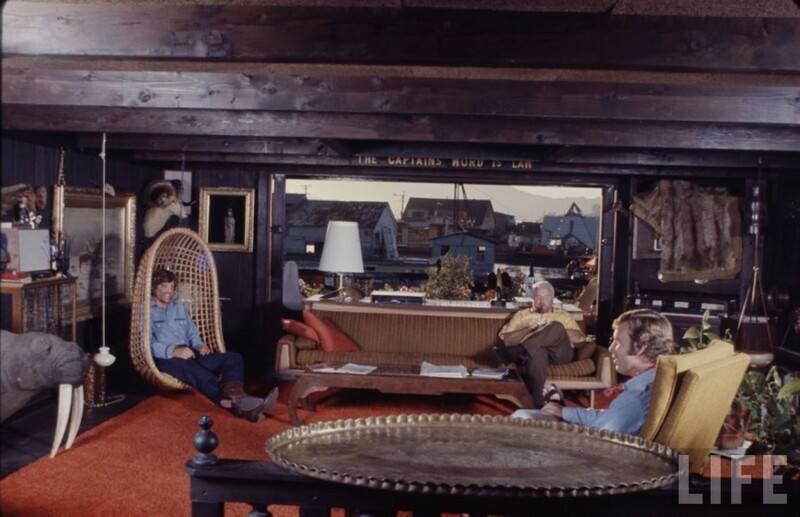 There is an indescribable charm about the life; one has the pleasures of boating combined with the comforts of home; sea baths are at one’s very threshold; fish are caught and cooked while you wait. 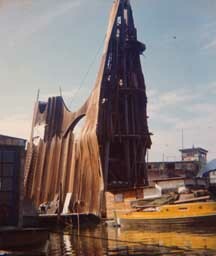 …The monotony of the scenery is varied by the swinging of the ark as it turns with the tide. 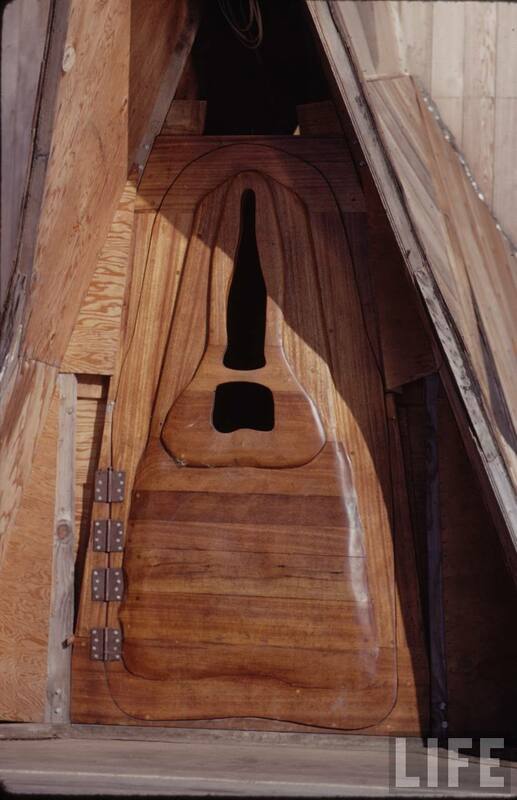 There are neighbors, thirty or forty families of them, within easy reaching distance if one can pull a stroke, for there is always a following of rowboats lazily resting upon the water in the wake of each ark. The butcher, the baker, and others …who supply the needs of daily life each has his little boat which he sends around every morning for his customary order, and the joint for dinner and the ice cream for dessert are delivered as promptly to the ark-dwellers as they are to those who are still in the city. 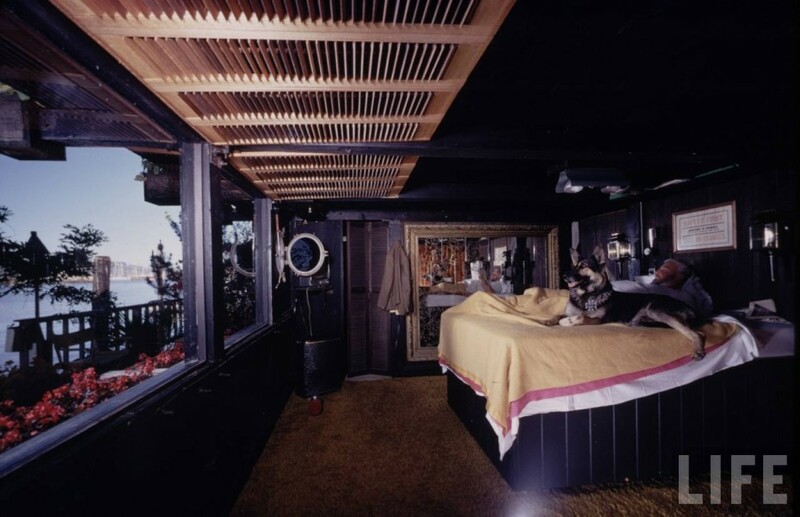 The parties were endless, and several famous bohemians were part of the scene, including the drummer for the Grateful Dead, Bill Kreutzman who lived there for a while. 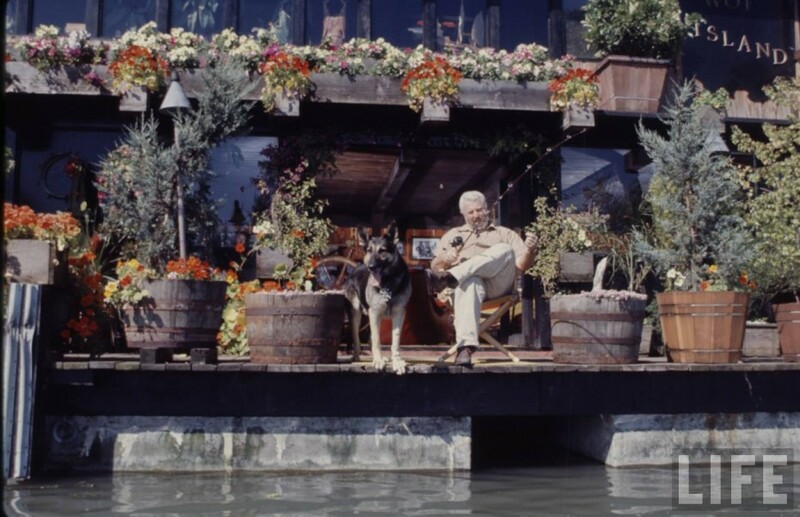 Noted California photographer Pirkle Jones captured the colorful characters of the Gates. 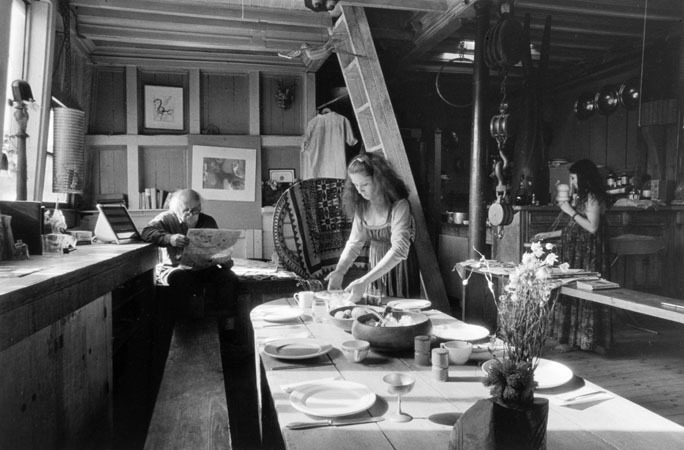 Jean Varda, collagist and close friend of Picasso on his Gate 5 houseboat with two dancers in 1970. 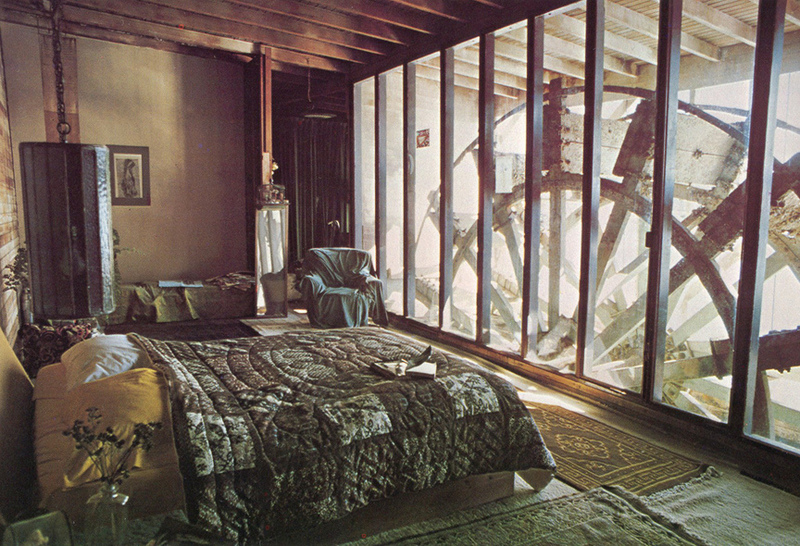 More of these images here. But of course, if you build paradise, people will come. 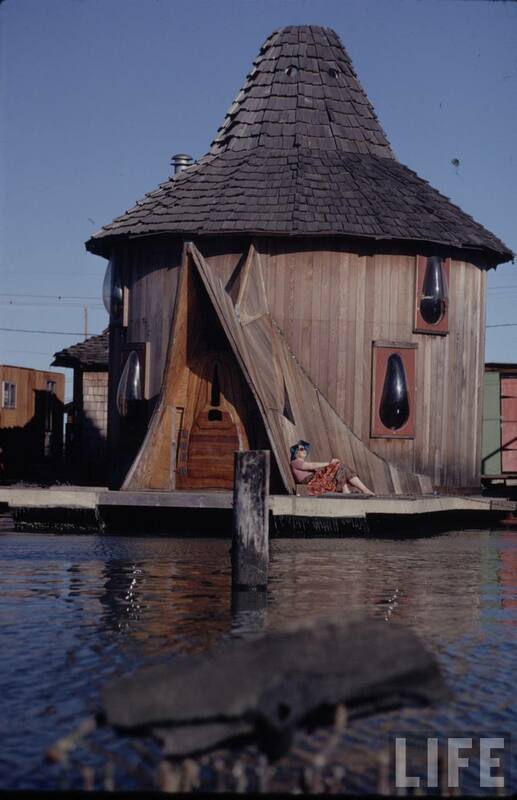 The waterside lifestyle became more popular, housing prices soared in the Bay Area and unpleasant issues such as waste discharge became a big problem. 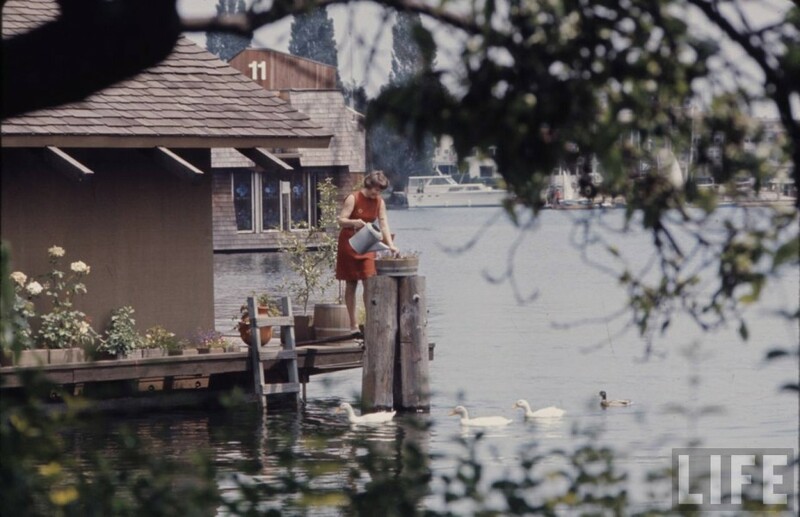 As the community’s population grew, the services provided by the marinas such as shower facilities and waste removal became overwhelmed. A law was established by the state to make a regulate development and prepare long-term planning. 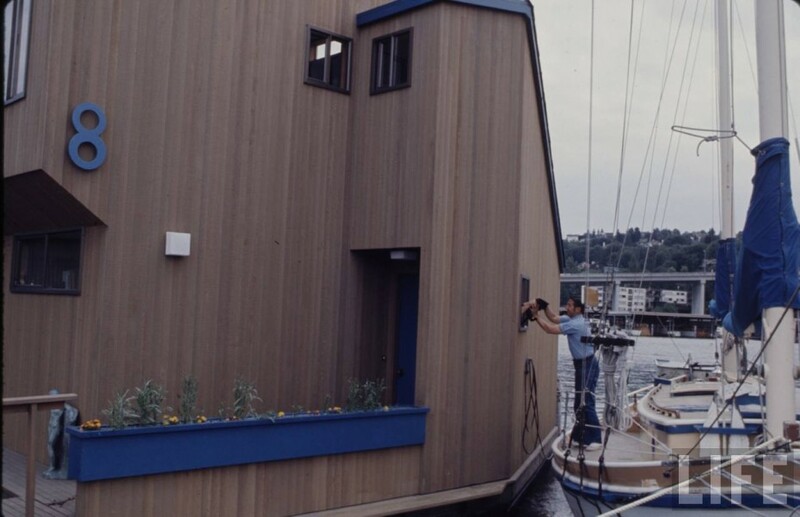 Houseboat owners were soon given the choice to either bring their homes up to code and berth them on docks where they would be connected to the sewer systems– or to pack their bags. 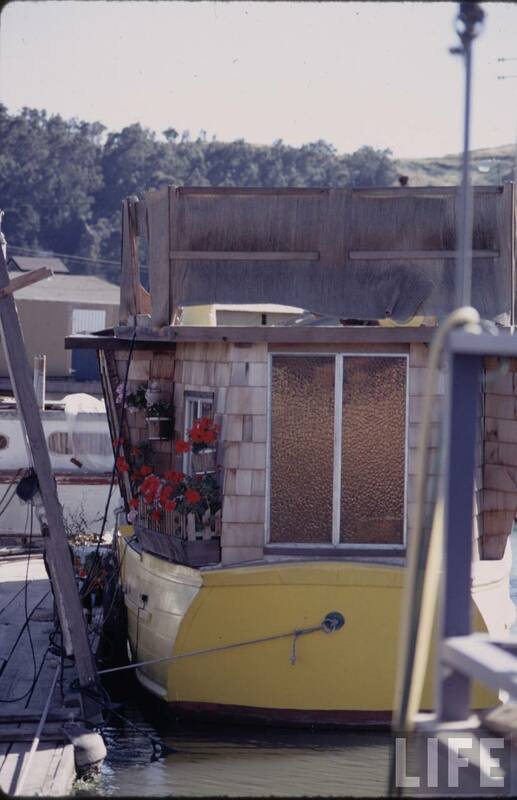 The “houseboat wars” of the 1970s began. 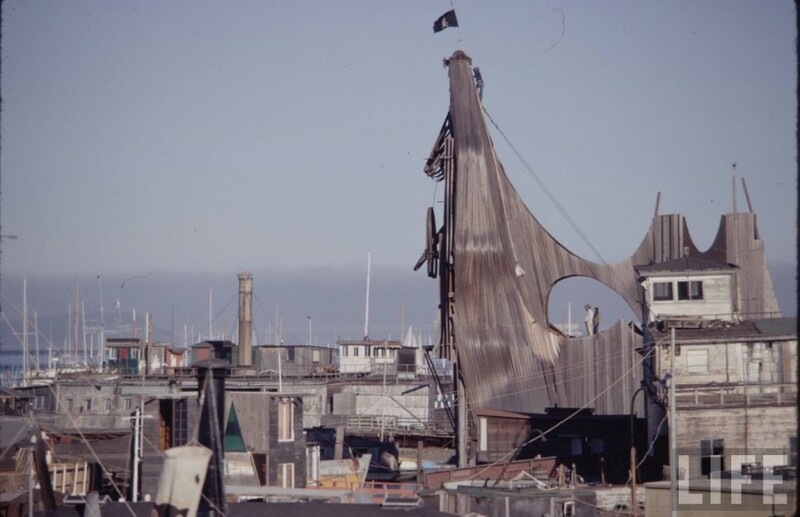 For a decade, it was common viewing on local news channels to see long-haired hippies defending their floating homes against sheriffs raiding homes and trying to play tough with the free-and-easy residents who refused to comply with the program. 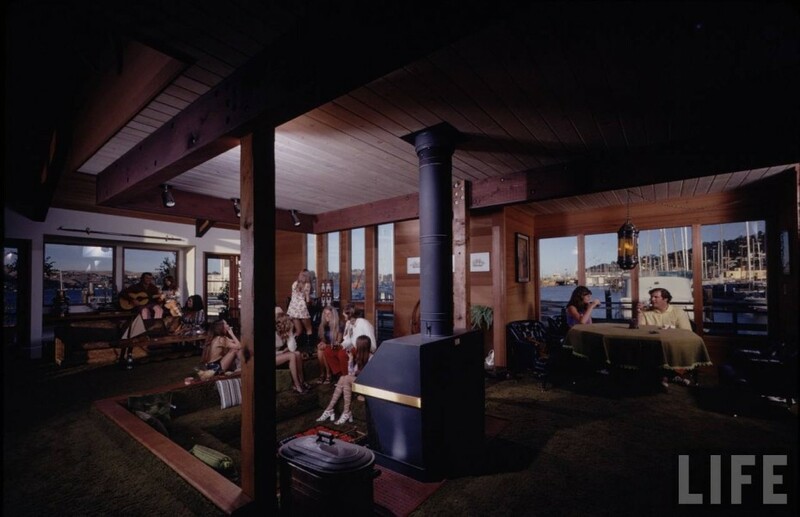 Meanwhile, just as the hippies had once infringed on the ship labourers’ community, middle class retirees and holiday makers began to make themselves at home in the marinas, with fancy new up-to-code homes complete with hot tubs and cable TV. But even to this day, the hippies, now with a few more grey hairs than before, are still trying to keep up the fight. 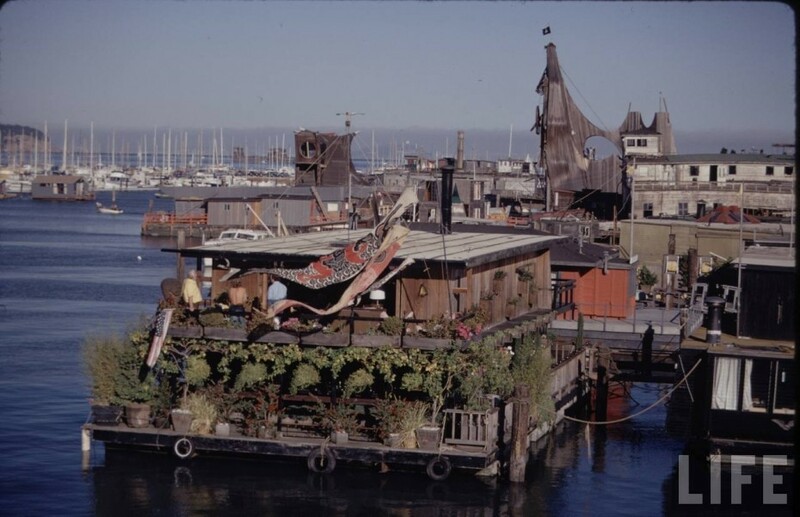 The Gates Co-Op represents the last of the 70’s era bohemian lifestyle, a small eclectic collection of houseboats, one called “the pirate ship” and a few built on the old WWII shipbuilding tugs. 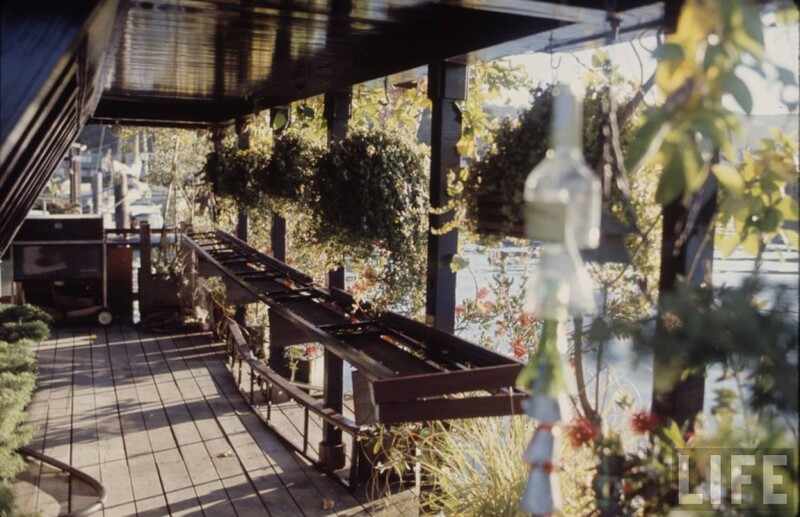 While protests are still being played out in courtrooms and hearings to this day, new development plans are likely to see these boats disappear within a few years. 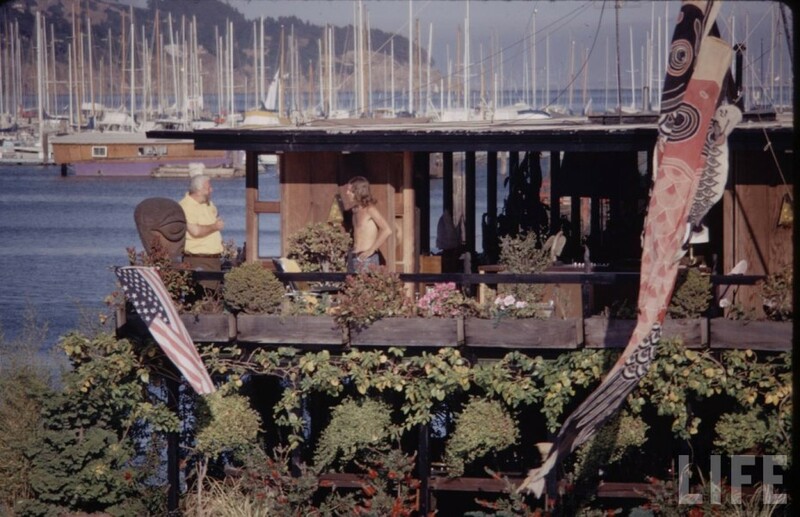 While most of the original hippies have left, the bohemian spirit is still alive and well at the Sausalito waterfront. 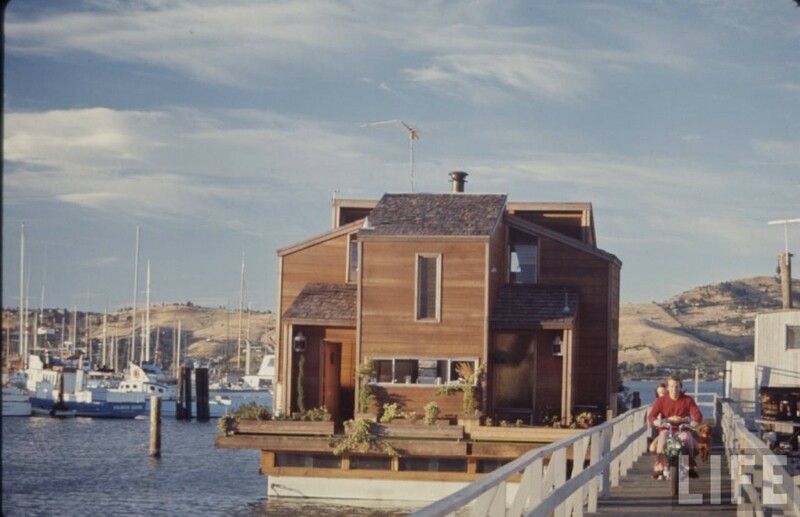 If you’re ever in the area, make sure to check out the Floating Homes Association website to see if you’re lucky enough to be there at the same time as their open homes tour. 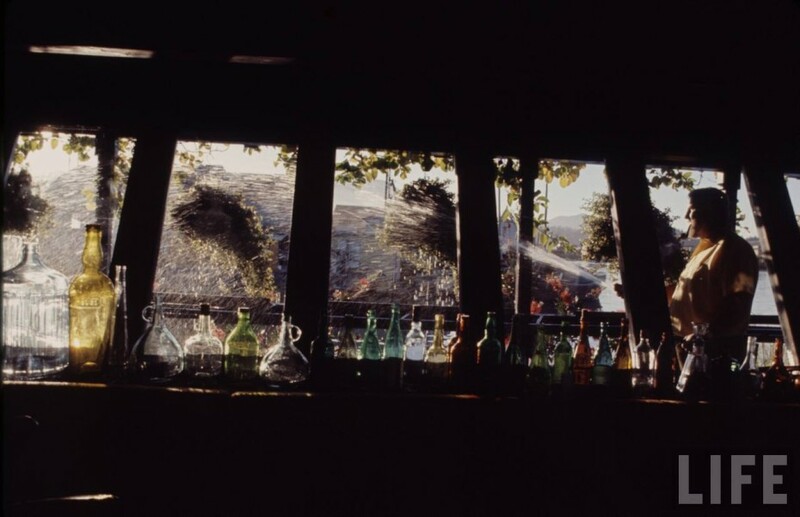 Life Photographs by Michael Rougier, find the full story in the archives here. 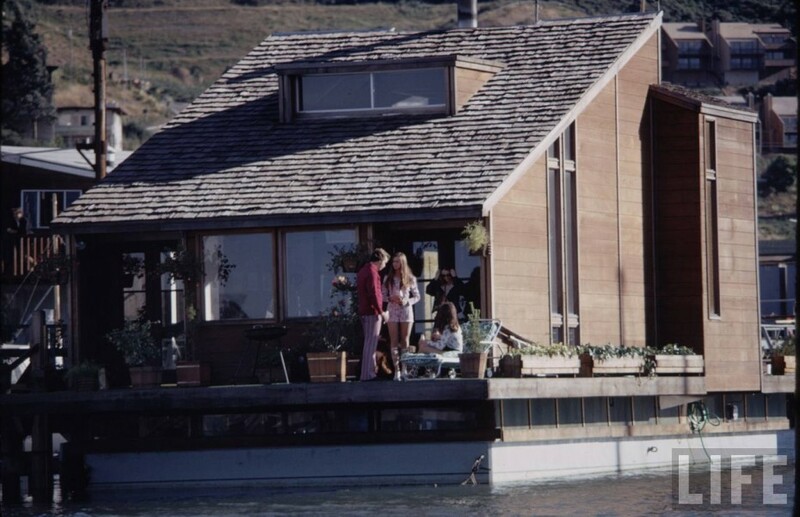 A photograph from the wonderful 1977 book, “Houseboat: Reflections of North America’s Floating Homes … History, Architecture, and Lifestyles”, available on Amazon.